Large containers, such as FLCs or sleeve packs, are used for larger components. 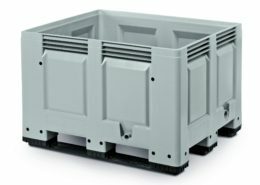 FLCs (Folding Large Container) are a well-known solution which can be extended from standard footprints to best fit your needs. We offer a full dunnage solution supported on steel bars. These can be removed and placed in the base allowing the FLC to fold down. This maximises return transit quantities helping to reduce costs in your production loop. 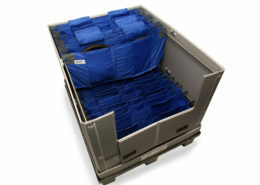 Large rigid containers are non-foldable and are ideal for all types of bulk storage and distribution. They offer a strong and robust packaging solution which is suitable for use with forklifts. With rounded rims and corners they are easy to clean, and can have skids, lids or drainage holes if needed. Various types of inner packaging can be fitted which will protect the product against damage. Sleeve packs consist of a corrugated plastic shell with a moulded plastic base and lid. Using our specifically designed units, we have incorporated steel corner brackets which provide additional strength and support for textile packaging. The flat sides prevent dust build up so is the more desirable container if parts are being taken to be painted. Our sleeve packs can be either folding or rigid, so like the FLC, the foldable solution can be stacked to reduce transport costs. Please click on the below portfolio images to see examples of our large container packaging solutions.